Some Kentucky residents at a certain unfortunate period in their lives may find themselves in a position in which they must consider the option of going into bankruptcy. If these people happen to be homeowners, then it often may be the case that they can no longer afford their primary residence, and thus find themselves facing foreclosure as well. If you or a loved one are in this position, then you may want to know all the options available to you, specifically whether it would be beneficial for you to file for bankruptcy to stop foreclosure. Black’s Law dictionary defines Bankruptcy as being in the condition of not having enough money to pay back what one owes. When you purchase a home through a mortgage, you possess a lien. A lien is a legal right for the lender to maintain possession of the property until the mortgagee pays the entire debt. If you find yourself in a state of bankruptcy and are no longer able to repay the debt you owe on a mortgaged property, the lender (the bank in many cases) may take possession of the property. The action of repossession by the lender, by means of a legal proceeding to terminate the mortgagor’s interest in the property, is known as a foreclosure. The purpose of the proceeding is so that the lender can recover the balance of the loan from the borrower by forcing the sale of the property. The purpose of the forced sale is to recuperate the balance owed to the lender. The Commonwealth of Kentucky and the State of Ohio are two of the twenty-two states which require the lender to gain permission from the courts in order to proceed with a foreclosure action. Foreclosure, by this means is known as judicial foreclosure. In Kentucky the respondent has 20 days to reply to the foreclosures notice. In Ohio the borrower has 28 days to respond to the summons and complaint. Failing to respond, or responding late, may result in a default judgment against the borrower. If your home is worth more than the balance that you owe on your mortgage, then your home is considered to have equity. Your home equity among other things will determine whether you should file for either Chapter 7 or Chapter 13 bankruptcy. The U.S. bankruptcy code court outlines five types of bankruptcy. The two types that are most relevant to this topic are Chapter 7 and Chapter 13 bankruptcy. The courts refer to Chapter 13 bankruptcy as the wage earners plan. The wage earners plan enables individuals to settle their debts in full or in partial. One of the advantages is that an individual who files for Chapter 13 may save their properties from foreclosure. As of the time of this writing, an individual is eligible for Chapter 13 so as long as his or her unsecured debts are less than $394,725 and their secured debts are less than $1,184,200. Chapter 7 Bankruptcy in contrast is essentially a petition for the liquidation of the individual’s assets, or a sale of the assets of the debtor in order to fulfill his or her obligations to creditors. The option of Chapter 7 is available to individuals, partnerships, corporations or business entities. Under Chapter 13, the debtor may pay his creditors in installment plans that can range from three to five years. The length of the payment plan is determined by the debtor’s monthly income in relation to the median income of their state of residence. For instance, if the debtor makes more than the state median then the plan is generally for five years. During this five-year installment plan the federal law forbids creditors from starting or continuing collection efforts. Another benefit of filing for bankruptcy is that it can assist the petitioner with income tax debts. After filing for Chapter 13, the debtor can discharge any of his income tax debt if he or she meets two deadline conditions: 1) More than three years have passed since the tax return for the tax was due; and 2) more than two years have passed since the tax return was filed with the IRS and or the state. Under Chapter 13, however, you are shielded from the IRS and State during the period in which you are paying off the tax debt. Additionally if your salary is below the state median and you file for chapter 13 bankruptcy, in most cases your income on all unsecured debt is dischargeable. In some cases, penalties and interest can be erased as well. Kentucky petitioners find that the most advantageous of the provisions they are granted is the automatic stay. An automatic stay is when the enforcement of a debt, judgement, lien or claim against you is temporarily suspended. [One of the advantages of debt cancellation through Chapter 13 is that the petitioner is not required to file an IRS form 1099c, also known as a cancellation of debt form. If a debt is forgiven, the 1099c form requires the debtor to report the forgiven debt as income. This income is in turn then taxable by the IRS. The reason that the forgiven debt is reportable as income is because it is a prior loan obligation that you are no longer obligated to pay. A specialized attorney will best assist you in determining your particular circumstances so do not hesitate to contact one as soon as possible. Lawrence & Associates has been helping Northern Kentucky residents save their homes for more than ten years, and we are now one of the largest bankruptcy firms in the state! 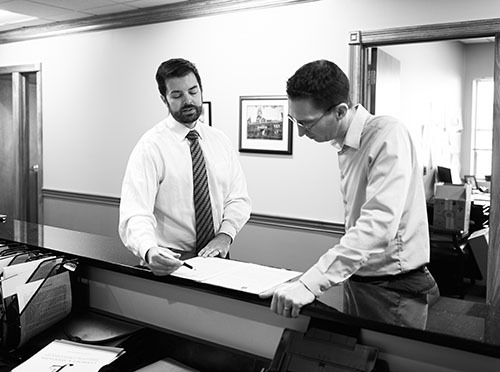 Give us a call to schedule a FREE consultation with an attorney, by phone or in-person! We’re Working Hard for the Working Class, and we want to help you! *Note to the reader: The law student that assisted with writing this article did not provide this section at the time this article went to press. Therefore, the bracketed section has been filled in by management.